Children grow like weeds — and before you know it they’ve matured right past Christmas. Hold on to the precious memories you create with your kids this year by commemorating the holiday with a fun handprint craft. 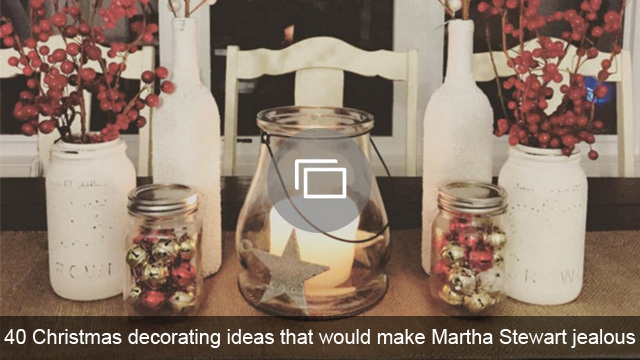 Transforming little handprints into beautiful holiday decorations that will be cherished forever is way easier than you think. Trace your child’s hand on the card stock. Cut out the handprint shape with scissors. Turn the handprint upside down. Glue the pom pom at the tip of the thumb to form the nose, then glue the eyes on the thumb closer to the palm. Cut the brown pipe cleaners into six 2-inch segments. 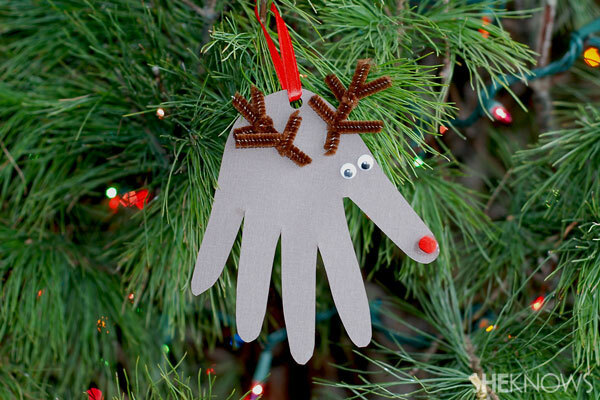 Grab one of the pipe cleaner pieces, and wrap two of the other pieces around it to form the antler. Repeat for the second antler, then glue the antlers in place on the card stock. Use your hole punch to make a small hole toward the base of the palm. Cut a length of ribbon and feed it through the hole to create a hanger. 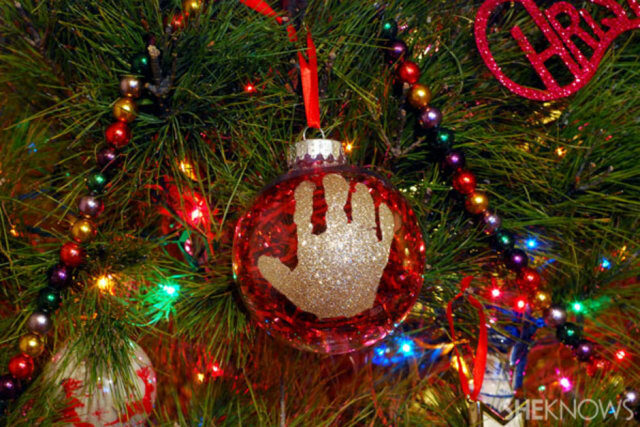 Coat your child’s hand in glue and press it against the ornament. Sprinkle glitter over the glue, then set the ornament aside to allow it to dry. Once the glue has dried, shake off any excess glitter. Remove the top of the ornament, then fill the inside of the ornament with brightly colored tinsel. Add the water to the bowl and use your hands to knead the ingredients until a dough is formed. Keep kneading until the dough is a uniform consistency. Take a small chunk of dough and roll it out on a floured surface to form an oval that is slightly larger than the size of your child’s hand. Press your child’s hand into the salt dough, then use the drinking straw to create a small hole near the edge of the palm of the hand for hanging. Allow the salt dough to dry for 2-3 days. 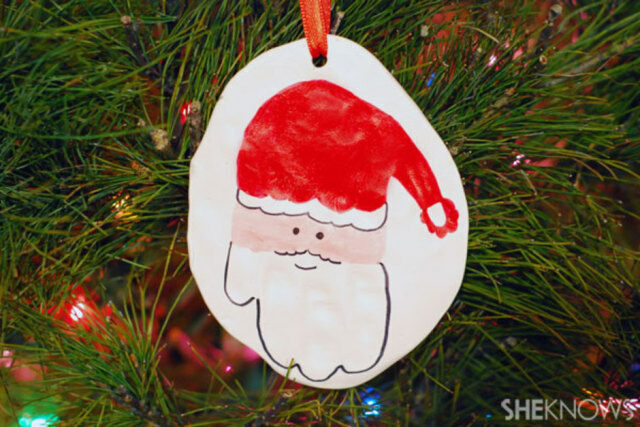 Once completely dry, color the palm of the hand red to form Santa’s hat, and outline the fingers to create the beard. Draw a face in the center. Thread the ribbon through the hole for hanging. 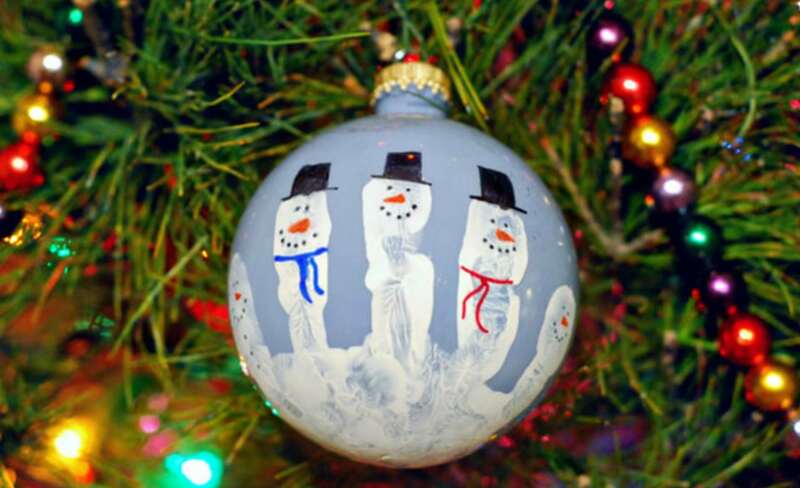 Dip your child’s hand in white paint, then press her hand against the ornament. Let the ornament dry completely. Once the paint has dried, transform the fingers into snowmen by drawing faces, hats and scarves onto the snowmen. Spray the ornament with the acrylic sealer to protect the paint, then allow it to dry before hanging it on the tree. Originally published December 2012. Updated December 2016.